There are very few things in life that make me happier than having rosé outside when it’s warm out. The other night was one of those happy nights – I know I’m late , but I was too busy rosé-ing to post and these were good rosés (sparkling Lamberti and the still was Belleruche Cotes du Rhone) and such a pretty pic that I figured I’d be forgiven. Sampling for Rosé Week (coming next month) has begun, so more info on the above soon. Have you guys been drinking any great ones lately? I’ve often likened drinking rose to drinking cheap cologne, but I think I’ll have to give the sparkling Lamberti a try. Rose is fantastic – light and easy but serves its purpose on many occasions! 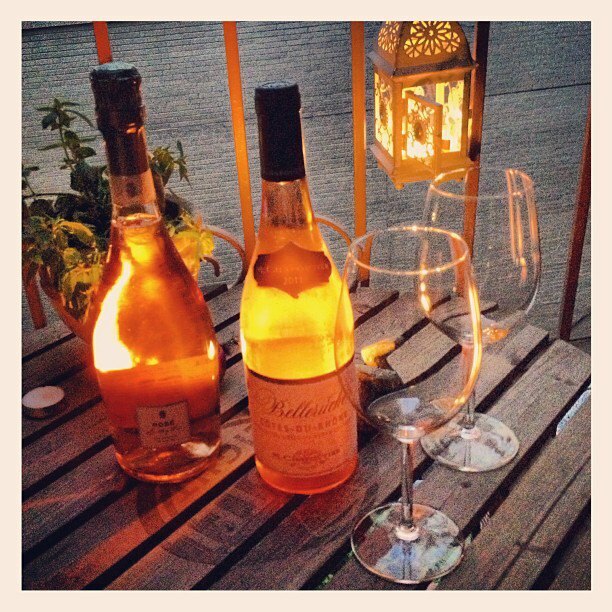 I am very partial to – Lucien Albrecht rose brut cremant d alsace france. I think the rose has come a long way. Lovely photo, by the way. I am new to rose & looking to learn more so I have a feeling your tastings will be ery helpful! Going to check out some of these reccos! I’m loving the Arnot-Roberts 2012 Rosé of Touriga Nacional & Tinta Cao. Super delicious! I attended a 50 cent wine tasting at Trader Joe’s Friday nite and had Incanto Rose for the first time and I liked very much. I am partial to sweeter wine and it was paired with a dessert. I will have to try the Lamberti. I also had a sparkling Prosecco, which I thought was nice as well. All good options. The Lamberti was very clean and had mellow berry flavor but not sweet. Rose week is coming next month, so check back! I am not anonymous…it’s Carly from Carly’z Corner! love the Charles & Charles Rosé from Washington State and L’Aventure and Denner from Paso! But sooo many good ones out there! We would drink perfectly together. C&C is my go-to for affordable rose. Lately I have been mentioning to people I really want to try a Rose. I just need to figure out where to start. This post and the comments are so helpful! Ehlers Estate in St. Helena in Napa Valley makes an excellent Rose, the Sylviane Rose. My mother is an avid rose drinker and her favorite was Whispering Angel, that is until she tried the wine from Ehlers. She stated to me categorically that she didn’t like California rose because they didn’t make a good one. Gauntlet thrown! She has taken that back and now orders rose from Ehlers Estates by the case. All I love rose! There is nothing else I would drink in the Cote d’Azur other than a Cote de Provence. In fact, if you drink anything other than rose there you’re immediately picked out as a foreigner! That’s what it’s perfect for! Any suggest on not too sweet rose’ ? I like Charles & Charles ($12) but doing Rose Week next month so check back for more recommendations! I’ve got to find this Charles & Charles you mention, sounds good. The Lasseter Family Enjoué is great! But 2x the $12 for C&C. I know someone who swears by Unti rosés, from Sonoma. Haven’t had it though. You are right, the picture was worth the wait! Love a good Rose”. Actually had to go on a quest to find some the other day as I have just moved to SC and not really familiar with the area. The grocery store didn’t have any, but thankfully World Market did! Looking forward to Rose’ week!